A crispy, healthy golden brown colored Bondas are perfect snack items for kids and elders at home. This is a snack variety that is deep fried! If you are not a fan of deep-frying, you would certainly want to take an excuse to try this dish for its wonderful taste, truly! This is called by various names like Seeyam, Suzhiyam, etc. in different regions in India. The recipe is generally prepared using Maida, but this one explained below is a conventional way of making the snack variety without Maida, and using Chana Dal. Take a thick-bottomed pan and add ¼ cup of water. Melt the jaggery in the water, and keep it aside. Now, take the dissolved jaggery and filter it out to the chana dal for making the filling. Mix both together well. Once oil gets hot, reduce the flame to medium. Remember to retain the same medium flame until frying all the Suyyam.<. 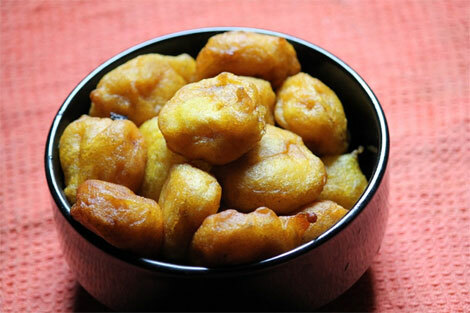 As the oil is ready to make the snack, you can take a filling dumpling and dip it in the rice-urad dal batter. Dip the filling thoroughly until it is fully coated with the thick batter and drop this into the hot oil. Your hot, tasty Suyyam is ready for a nice, sweet evening snack craving!